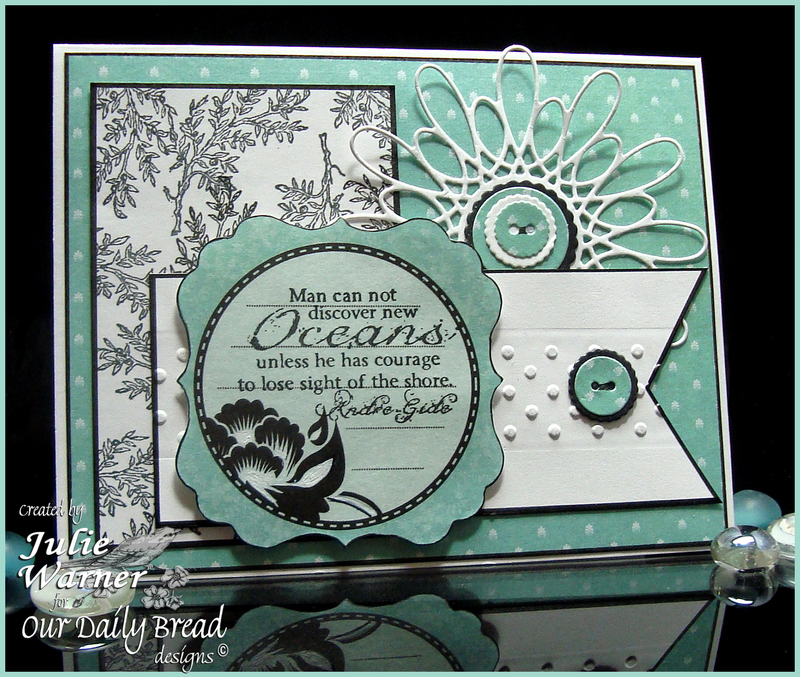 Congrats to Susan, today’s Featured Stamper on Splitcoast (FS277)! I chose her lovely Brayered Sympathy to case. I kept the layout but made my oval a frame instead of a layer. And I also used a brayer for my background but changed the colors and images. 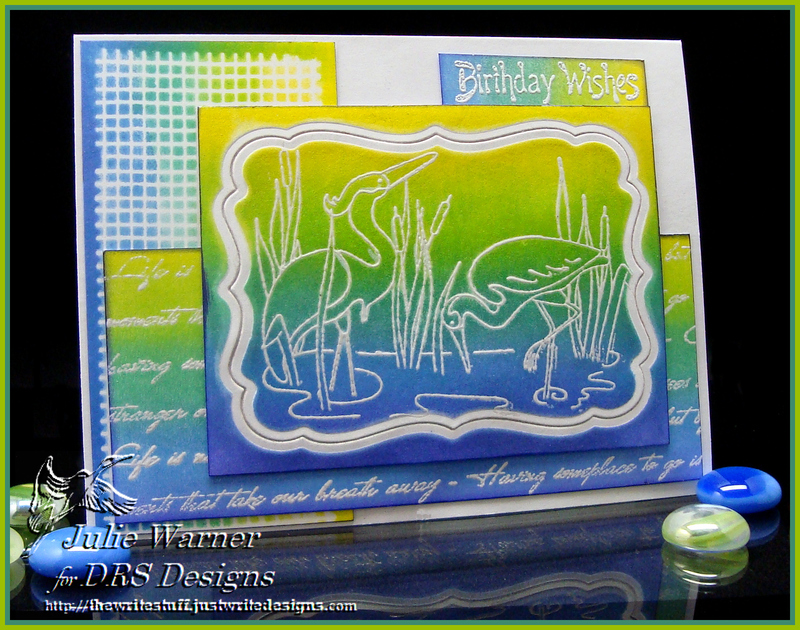 The image is new from DRS Designs and I used a brayer and two rainbow pads to create my background before I stamped the cranes. I masked the water area and used the Desert Heat ink pad on the top. This area was then masked and I used the Blue Breeze ink pad for the water. I used a small acrylic paintbrush to apply bleach to the images to remove the color. After bleaching, I dried it quickly w/ the heat tool. The bleach has to be dry in order to use water based markers to add color back in. If the bleach isn’t dry, it will just continue to remove whatever color I try to add back in. I die cut the largest petite oval in a piece of white cardstock and used it for the frame. The little summer sun was cut out of a larger image and colored. A few highlights were added on the water using a white gel pen. The finished card is 4.25 x 5.50. What a wonderful site for today’s Inspiration Challenge on Splitcoast (IC338)! So much to look at so I just chose my two favorite colors and went thru pages of beautiful items until I saw this Fringe Necklace. Love those colors! The images are all from DRS Designs. 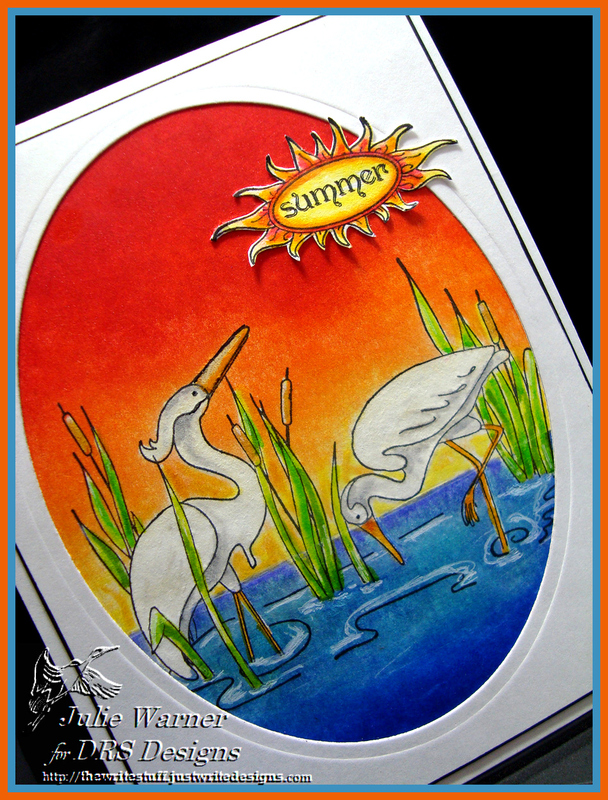 Everything was white embossed and then I used a brayer and a rainbow ink pad.On the cranes image, I die cut it before I brayered it and left the die in place to get the white shaped border. The strip down the left was made by attaching a piece of drywall mesh before brayering then removing it afterwards. The finished card is 5.50 x 4.25. 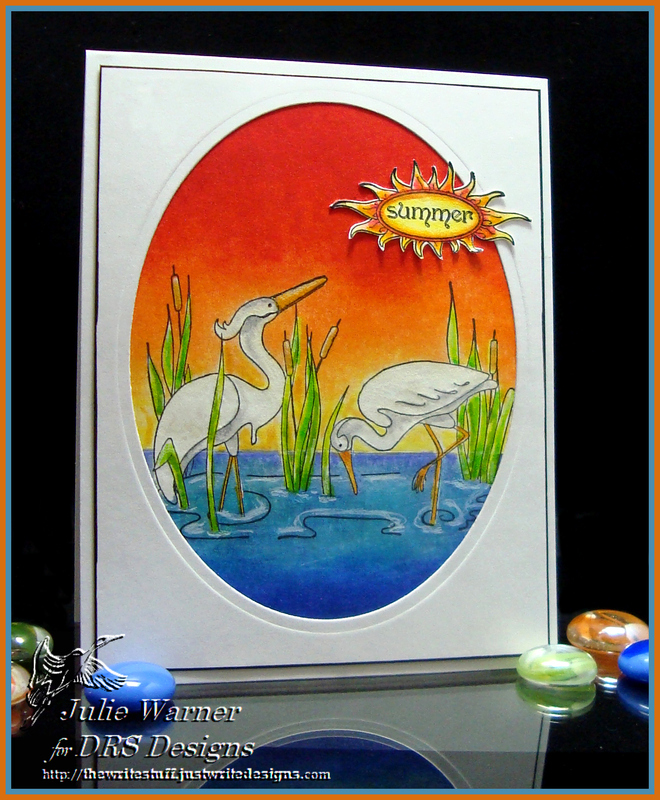 This was made for today’s Sketch Challenge on Splitcoast (SC386).Fun sketch and I only pushed it a little by adding the little sentiment label on top of the horizontal panel. But it came w/ the dp paper pad and my sentiment fit on it perfectly, so I really wanted to use it. The sentiment and image on the black & white background are both from Our Daily Bread designs. For the white band, I cut the notch on the right and embossed w/ a border folder. The semi-circle element on my card is a swirl die w/ some die cut buttons layered in the center. The rest is all designer paper. Pretty easy!